We recently spent four nights at Gondwana Collection's Hakusembe River Lodge. We had been there for two nights and then left for three, and then returned for two more. When it came time to leave, we didn't want to! 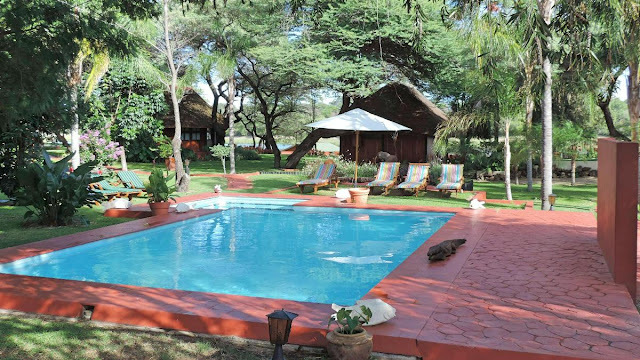 Hakusembe River Lodge is located directly on the banks of the Kavango River in northern Namibia. On the other side of the river is the country of Angola. There's been some construction at Hakusembe and they've almost doubled their capacity. It's still a small and personal lodge though. Even with the new chalets there's still only 24 units...and they're really nice! We had a great view from our front porch. Spent a few hours here just reading and bird watching. When we came back for the second set of two days, we specifically asked for one of the older chalets. We got the one right next to the restaurant and bar area which was okay because we were able to get the wi-fi signal from our room. This section of the resort is beautiful...lots of greenery and flowers! It's a really pretty spot, and they're lucky to have access to all that water from the river to water the flowers and grass. And they do it really well. Speaking of greenery, they also have their own vegetable garden and you'll often have fresh produce as part of your meal. Not only do they serve your choice of breakfast, but they also have a really good buffet table with fresh fruit, yogurts, cereals, meat, cheese, and breads. Now this is an African sunset! When it was time to leave Hakusembe, we didn't want to. This is a small resort and the staff treat you like family. We especially want to thank Raulinda and Virginia who helped us learn a few new words in the local language...Pandu! And assistants Eddie and Yvonne were the best...always helpful and smiling. We never did get a chance to meet with the managers, they were gone the whole time we were there. But it didn't matter. Eddie and Yvonne certainly seemed to have things well under control! When it came time to take a picture of Eddie and Yvonne, Eddie was gone to town! Here's bartender/waiter Simon who looks quite happy next to Yvonne. Sorry Eddie! We had a great time at Hakusembe. It's such a pretty spot. Criticism? Not much. It's the only Gondwana lodge we've been to so far that doesn't have coffee and tea available in the room. However they do bring coffee and tea to your room at whatever prearranged time you would like it. For us, we like to be able to make it ourselves when we get up. Pretty minor detail. Oh, and some of the older rooms could use some updating. Curtains were a little too sheer and let in too much light. The new rooms were great though! We want to go back...and stay for a week or two!! So far it is one of our favourites! I'm only guessing, but it's likely we would not easily be able to pronounce some of their real names. Yep, eggs and meat are certainly popular with locals as well as their maiz porridge which some lodges have also had on the buffet. I'll just bet words can't describe - but, yours sure make me envious! I love new places and new scenery, but I really love new people. Thanks for the photos. We too love new places and new people, and trust us they are very friendly here. Love travelling with you guys. Glad you are enjoying the adventure with us. Don't you just love that shoulder, not streaky, bacon. I can certainly understand why you'd want to stay on longer. I felt that way about almost every place I stayed in South Africa. We love the bacon here! It tastes so good! We are finding that in Namibia too but we are also looking forward to South Africa.